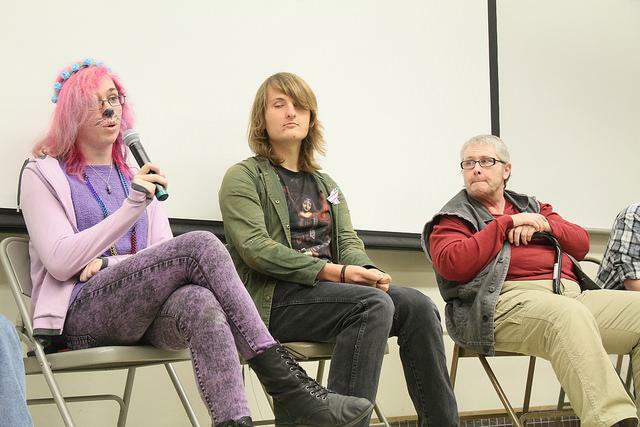 In the midst of Transgender Awareness Week, American River College students piled into a packed lecture hall on Thursday to listen to a college hour presentation geared towards creating a greater understanding of the transgender community. ARC student Brett Spencer, who volunteers at the Community and Diversity Center, opened up the presentation in order to introduce the audience to key terms and concepts relating to the transgender community. Expanding on the concept that members of the LGBT community don’t fit into current societally accepted roles, Spencer said that it’s a very difficult burden to carry for those whose sexually orientation runs against the grain of common conception. “We often spend a tremendous amount of our time thinking about who we are, trying to reconcile within ourselves our sexual orientation based on social norms and customs that we’ve come accustomed to and we find that they’re often in conflict,” said Spencer. Following Spencer and a 20-minute video titled “Transgender Basics,” a panel of six ARC students who identify with the transgender community answered questions on their own personal experiences. One of the questions asked was how allies of the transgender community comfort and talk to those dealing with depression spurring from their transition. Kylie Marx, who was one of the students on the panel, said that, she fights depression each day with the sense that at least one good thing will happen. Another one of the panelists, Zahra Kruk, stressed that gender validation is an extremely important part of the transition process. Shonn Sutton, who is an ARC student and member of the Fierce Club, said that he’s been on hormones for two years and that he is much happier after identifying as transgender. One thing that all the panelists pointed to as being helpful is the Gender Health Center in midtown Sacramento. Regina Drake, a transgender student at ARC, described the center as one of the main places she was able to find support when first coming to Sacramento. Be the first to comment on "College hour focuses on transgender community"